Bordered by Gujarat and the Arabian Sea, Daman and Diu is a union territory which has been ruled by the Portuguese for over 450 years. These different regions of Daman and Diu are separated by the Gulf of Khambhat and form the smallest federal division of India altogether. Being the part of Portuguese India for several centuries, Daman and Diu reflects their culture and heritage through the presence of forts and ancient buildings which were made during the rule of the Portuguese. How about planning a trip from Ahmedabad to Daman and Diu, the ancient Portuguese colony? As the weather is hot and humid during the summer season, it is advisable to avoid visiting Daman and Diu during Summer. If you desire to spend your time surrounded by pleasant climate and the cooling effect of sunrays, then the best time to visit Daman and Diu is from October until the end of March. By Air: You can take a direct flight to Diu airport from Ahmedabad. By Rail: There are no direct trains available between Ahmedabad and Daman and Diu. However, you can catch a train from Ahmedabad railway station to Somnath Junction which is at a distance of 63 km from Diu. By Road: Daman and Diu are well connected to Ahmedabad and other cities; hence, it is easily accessible by road. You can either take a direct bus or hire a cab to Diu. While on your way to Daman and Diu, you can take a break at the following places. Vadodara is one of the major historical centres in Gujarat. Ranging from royal palaces to tombs and gardens to lakes, it has everything to allure tourists from all around the country. Vadodara is also known as a cultural city on account of its age-old culture and traditions. The major places of interest in Vadodara include Laxmi Vilas Palace, Baroda Museum, Hazira Maqbara and Sursagar Lake. In other words, it is an ideal mix of nature and history. Covered with forests, Valsad is a small town in the state of Gujarat. Famous for its teak production and unpolluted beaches, Valsad has become a tourist spot over a period of time. Apart from its beautiful beaches, it also houses several wonderful temples dedicated to Hindu gods. How about taking a break at this coastal town? Diu Fort is the most prominent ancient building in the union territory of Daman and Diu which attracts millions of tourists every year due to its marvellous architecture and historical significance. 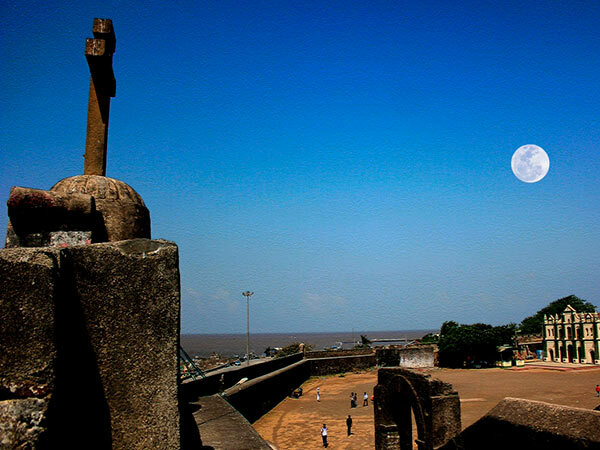 Diu Fort is also considered as one of the 27 wonders built during the Portuguese rule. Built in 1535, it is made out of sandstone and lime mortar. If you are looking forward to exploring the history of the union territory of Daman and Diu, then Diu Fort is a must-visit place. Nani Daman Fort is another significant fort built during the Portuguese rule. Built in the Daman part of the union territory, this architectural wonder also has a church within its compound. Even though few parts of the fort are in deteriorating conditions, it still attracts tourists in thousands of numbers. Apart from Diu Fort and Nani Daman Fort, you can also visit Portuguese Fort, Fort of Moti Daman and Fortim Do Mar. One of the most famous beaches in the union territory of Daman and Diu is none other than Nagoa Beach, which is an evening and morning destination for joggers and photographers. Nagoa Beach is immensely popular for its remarkable beauty at the time of dawn and dusk when the beautiful sunrays reflect on its sparkling sand and the dazzling waters. This beach in the form of a semi-circle also offers its visitors with the opportunities for swimming and fishing. You can also visit other beaches such as Jallandhar Beach, Devka Beach and Jampore Beach. Built in Roman style of architecture, Bom Jesus Church dates back to the 17th century during the reign of the Portuguese. The church houses six marvellous statues of Christian saints and is decorated with paintings and wonderful carvings. Today, Bom Jesus is a significant part of the heritage of Daman which certainly showcases the rich culture of the Portuguese who lived here. Would you like to get yourself within the boundaries of this perfectly chiselled church? Dedicated to Mahavir Swami, Jain Temple is an 18th-century temple which is built of white marble and is popular for its intricate patterns and beautiful drawings over the walls and the pillars. The walls also have certain murals which depict the overall life of Lord Mahavira. How about paying a visit to this ancient temple? Apart from all the above places, you can also visit the Portuguese Fort, Nadia Caves, Daman Freedom Memorial, Tower of Silence and Fortim Do Mar.